Indie Retro News: Edge of Time - Sideways SEUCK C64 game release! 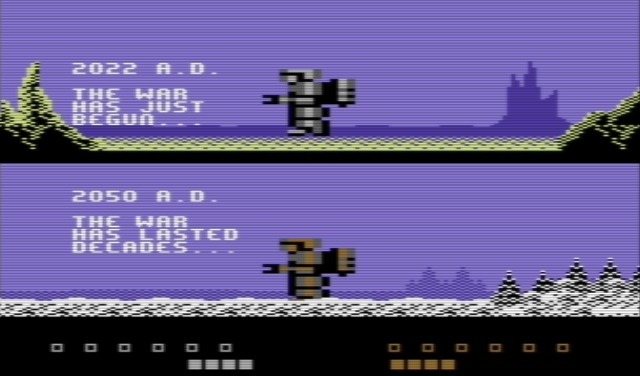 Edge of Time - Sideways SEUCK C64 game release! 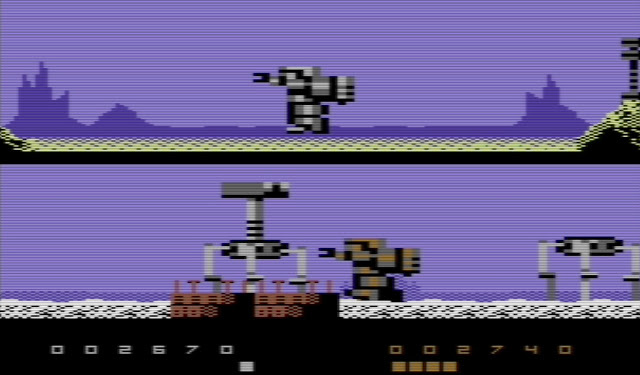 Possibly the last C64 article of the day unless something interesting comes out, is Alf Yngve's SEUCK C64 game ' Edge of Time. That was released for the Sideways SEUCK Game Creation Compo 2015. In this rather difficult sideways shooter with music by Richard of TND; you control two robot like characters shooting at enemies each from a different era of time. The top one is from 2022 A.D with the war just beginning and the second from 2050 many years later. For what is a rather manic shooter, Edge of Time is certainly unique in how dual shooting is used to control two characters. You must keep an eye on both split screens in dealing with the different type of enemies, however controlling one character also controls the other. So don't be surprised if it looks odd shooting at nothing at the bottom screen while blasting those on the top. For what it's worth this is a very difficult but fun game with very nice landscape detail, that requires all of your attention. So download it today, and let us know your high scores!